More stress baking happened this weekend. The result? Chocolate fudge cupcakes with cookie dough filling topped with chocolate frosting and caramel drizzle finished with a tiny sprinkle of sea salt. This is more of a concept set of directions rather than a step-by-step recipe. I got the idea from multiple photos on Pinterest. For now though, I’ll share with you the simple tricks of these great cupcakes. Remove label from unopened can of condensed milk. Fill a deep medium saucepan with water. Bring to the boil. Carefully place the can in the saucepan. Simmer, uncovered for 3 hours ensuring the level of water is always covering the can. Carefully remove can from heat and allow to cool completely before opening to use the caramel. Meanwhile, prepare favorite cookie dough recipe. Refrigerate cookie dough for about an hour, until easy to work with and not sticky. Roll cookie dough into 24 small 1 to 1 1/2 inch balls. 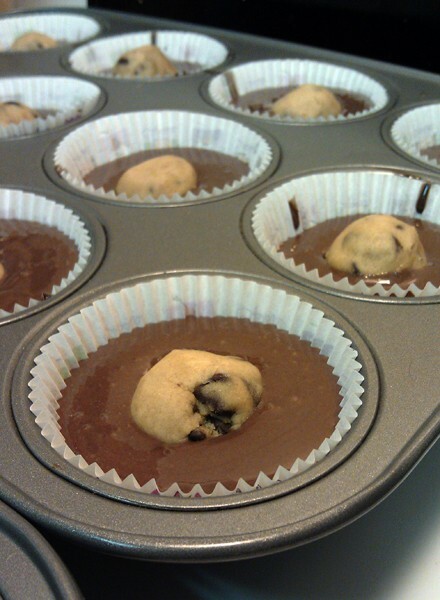 Freeze these for at least 30 min, longer if you want the cookie dough more raw in the center. *Note: The more raw you want your cookie dough in the center, it is recommended you use an egg-free recipe. Since my cupcakes come out with the cookie dough baked as opposed to raw, I don’t worry about this as much. Heat oven to 350 degrees Farenheit or temperature recommended for cupcake batter recipe. Prepare two 12 cupcake tins with cupcake liners. Prepare favorite cupcake batter recipe. Fill each cupcake cup approximately three quarters of the way full. Remove cookie dough balls from freezer and carefully place one ball into each cup of batter. 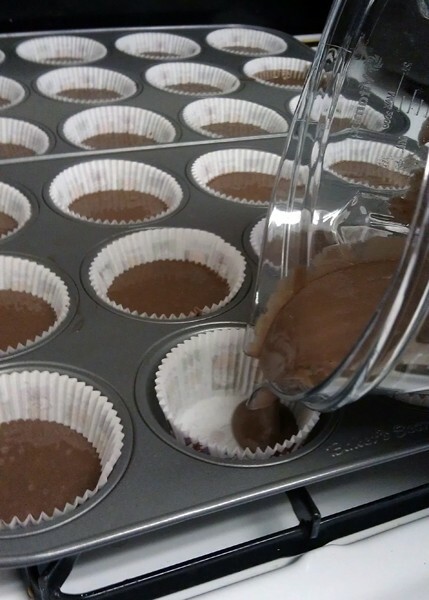 Allow to sit on top if you’d like the dough to be more in the center of the cupcake or press gently to the bottom of the cup. Bake for the recommended time of the cupcake batter directions. Test with a toothpick for doneness (toothpick comes out clean when done). 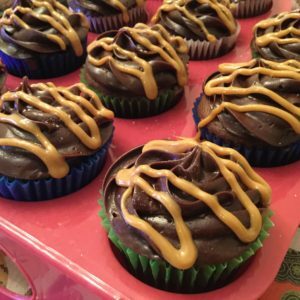 Top with your favorite chocolate icing, then carefully pipe or drizzle the caramel over the cupcakes. Finish with a fine sprinkle of sea salt. Struggling with writer’s block, I decided to get out of the house yesterday. I ran errands with the boyfriend to mail out ARCs of Ultimate Courage and talked about high cupcake standards with the girl working the counter at UPS. Apparently, cupcake places only last a few months in the Phoenix area and then go out of business. Why? Hmm. But we’re hoping a new place that specializes in cocktail inspired cupcakes will last. Excellent quirky things to write into a book. We stopped to get the car washed and detailed. I took my diploma, from the Masters Degree I earned over 10 years ago, to be framed. Then I popped into World Market for tasty international treats and Ulta looking for the Too Faced Peanut Butter and Jelly eye shadow palette. I didn’t find the elusive eye shadow palette. 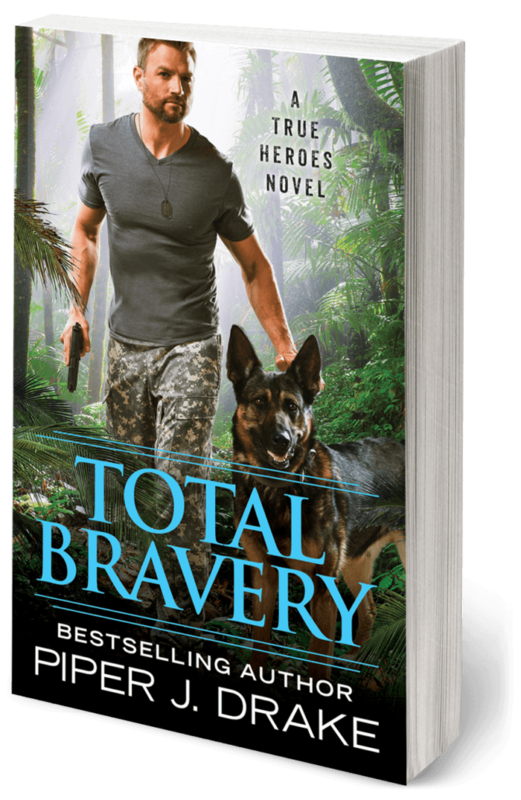 It’s sold out both in store locally and online. But I fired up a chat with two of the make up consultants as I tried on daring (for me) summer lipstick shades from Urban Decay’s Vice line. One of the make up consultants told me he once had a client that paid him $85 a day to do her make up for her, every Friday and Saturday. She’d moved to Florida eventually, but still flew him out to do her makeup for special events. And he stayed in her beach house when he was out there. Whoa. Very cool. Taking mental notes because that’s a fun character idea. PSA: people, this is seriously unhealthy and could cause infections. Just take the extra time to get a consultant to help you disinfect that lipstick or blush or eye shadow or whatever before you try it on. And boyfriend walks in, letting us know the police have cordoned off a portion of the parking lot right outside. In addition to standard police, TAC was on site. They’d also expanded the secured area three times in the time it took me to try on two lipstick shades. Could’ve been a bomb threat. Could’ve been a robbery. There were actually quite a few possibilities. My writer’s brain was going crazy with all the possible plot bunnies. And for some odd reason, the Ulta suddenly got incredibly busy. The general store manager had to hop on a register with two other cashiers to handle the line. Why the influx of shoppers just yards away from a developing police investigation? And mysteries, puzzlements, conundrums, are fantastic mental stimulation. I came home with a mind full of What If? Ready to write and ready to take my story unexpected places. All of this, because I went out to run a few errands and indulge in a bit of shopping. It was well worth the cost of a lipstick. 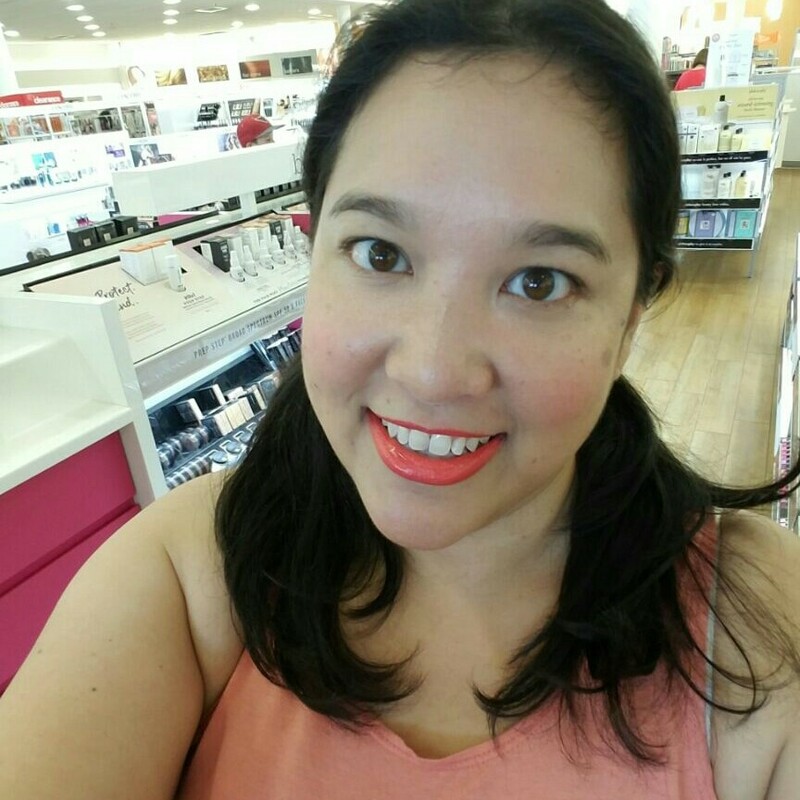 I decided to get out of the house and tried on Urban Decay’s Vice lipstick in Wired. This was not the color I ultimately bought.